This is a 71 minute B-movie which rolled across Turner Classic Movies recently. Not sure what caught my attention about this over any other title which floats on by, but I was intrigued enough to give it a run. I watched THE HITCH-HIKER (1953) on 6.7.12. It was my first viewing of the film. Definitely a B-movie, this isn’t concerned about cinematography, lighting, editing, or anything like that. 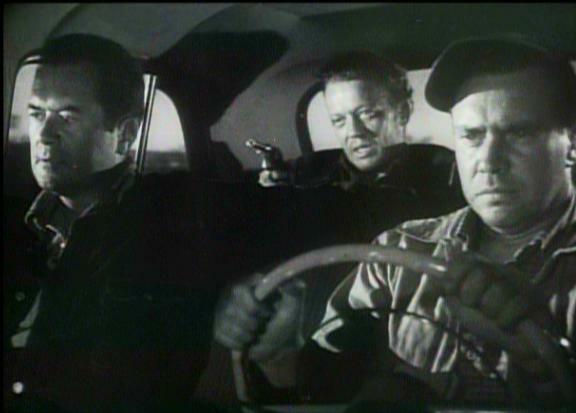 Instead, we are allowed to glimpse a raw story of a killer, Emmett Myers, hitching a ride with a couple of men. Myers is quickly established to be a murderer, and is clear about his intentions to eventually kill these two guys once they stop being useful in his quest to ferry out of Mexico. This movie is old enough to avoid being cliche. There is no screaming female here, as most films of this genre like to portray. In fact, there are no featured women at all in this picture. Instead, this is man versus men. The shortcomings of the script are mired in its inability to remain fresh. A half dozen times Myers asks his front-seat hostages to exit the car the same way. Several times the two protagonists discuss escape, only for one to suggest patience. We know a showdown is coming, and other than one scene in which Myers forces one man to show his marksmanship by shooting a can out of the other man’s hand, nothing renews the action. In giving us that featured scene, a seemingly obvious piece of foreshadowing never comes to fruition because the alluded to shooting skill never is needed again. I’m not sure if this is brilliant diversion or unsophisticated script-writing. Normally I would avoid cynicism and say it was a smart choice, except the ending is so pedestrian (with the protagonists easily overpowering Myers), that I’m not sure much thought went into the proceedings. But these weaknesses don’t entirely derail the film. Despite mediocre acting and slightly below-average writing, this is an entertaining enough B-movie. I don’t see where I’d watch this over having some new filmic experience, but it was certainly not a complete waste of time. ~ by johnlink00 on June 7, 2012.